UPDATE: Due to really bad road conditions and no sign of improvement, I have to postpone my clinic. I will plan on rescheduling ASAP. At the request of Amy Carden, manager at R&J, I am presenting my bouldering clinic next Monday, January 31 at 6pm. I am going to be focusing on the same themes as my last BRC clinic. Close analysis of technique, assessing tactics, self-assessment of strengths and weaknesses, and climbing awareness are the primary elements. These factors can boost excellence in both bouldering and sport climbing. Yesterday, I spent a little time bouldering with two elite-level climbers and used the opportunity to really closely observe the ways in which they engaged the holds and the moves. Jonathan Siegrist uses powerful crisp movements done close in to the wall while Matt Wilder tends to hang away from the wall more, finding the balance point which works the best. Looking at really good climbers enables you to think clearly about your own style and the ways in which you can adapt other people's styles to your own. Climbing gyms give the best opportunity to do this kind of comparison and are why they make a good investment beyond the actual climbing. Boulder CO has been in a deep freeze and I have been finishing up the book. So my climbing time outside is essentially zero. Fortunately visits to the home wall, The Spot, The Boulder Rock Club, and CATS can substitute for the real thing for a while. However sometimes I get the feeling that for many climbers, climbing inside becomes the real thing. So what is the difference between bouldering outdoors and indoors? 1. The size of the holds. Even at CATS, one of the few public gyms that has loads of crimpers, most of the smallest handholds are still not as small or complex as holds outside. At the Spot or the BRC, most of the holds are quite large with dynamic long moves and very limited feet to create difficulty. The kinds of crimps, and micro-features you have to use on harder problems outside are rarely encountered inside. Compared with outside, 99% of gym footholds are ledges by comparison. Learning to climb better outside may mean focusing on using the smallest footholds you can find inside. 2. Texture. I have been climbing on real rock and artificial holds for a very long time and if there is one thing about gym climbing I don't like, it is the texture, the "hand" so to speak, of the holds. There is such a difference between real rock, whatever type, that has been molded and affected by natural processes and plastic. While smooth hold textures can prolong a training session nicely, the roughness and complexity of real rock can be a wakeup call. 3. Landings. Gym climbing can be very dangerous, no mistake. I see people blow it at the Spot all the time. Friends have been forced into lengthy layoffs from falls at CATS. 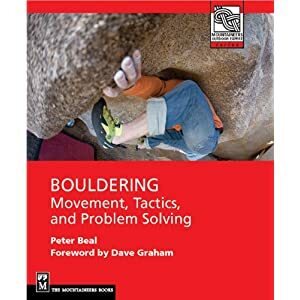 However learning the ins and outs of safe falling and landing on complex surfaces is crucial to climbing safely on boulder problems outside. 4. Movement types and setting. Gym setting is a perennial topic of discussion and I find myself forced to say, "It is what it is." I know a number of pro routesetters and they do their job well. I have done a fair amount of it myself. It is hard physical work that can be frustratingly fussy. But it can be hard to translate their work to the natural environment. The majority of problems in contemporary routesetting feature fairly large holds far apart, usually pretty sloping on the low-angle walls or fairly incut on the steeper ones. Physical power and friction seem to matter the most. Precise grip, core tension,footwork and technique rate lower. 5. Environment. I actually really like the gym environment, even if most people I am around are half my age. There is a certain energy and animation to the setting that can boost motivation. Folks used to the noise, the movement, the music etc, may find the quiet and stillness of the outdoors a little unsettling. I find it to be a source of strength and restoration of centeredness and balance, being among ancient boulders and old trees. This helps me to focus clearly on the task at hand and enjoy the process more. The permanence of the boulders and the changing scenery and conditions of the natural environment complement each other. I will always like gym climbing. You can't have a life and not need some time climbing hard in a gym to get stronger and keep fitness high as possible. But in a perfect world, I would always climb outdoors. Recently I was working on my finger board downstairs in the house and discovered something interesting to me, if not very original. I can hang onto a single-pad edge with two hands and about 100 pounds added on without too much trouble. With no weight I can hold on with two hands for 45 seconds to a minute. So far so good. Now hanging with one hand on the same edge, I can hang around 5 seconds with no weight or about 2 seconds with 5 pounds held in my free hand. Why this radical disparity? Good question and I am not sure I have heard or read any good explanation. I think it is partly biomechanical as the two arms, back and abdominal muscles working together help manage the load much better, probably through balance and opposition, than separated. But it seems to me that this finding also indicates that traditional modes of two-handed training require a huge overload for very little real payoff, especially since climbing requires that hands and arms operate independently of each other. So pull-ups, weighted or not, actually add very little to one's overall necessary one-hand strength. So what are the implications overall? Well for me, isolating one hand for hanging on an edge certainly makes more sense than spending too much time with two-hand hangs. However even this has its limits as I will explain below, And these exercises are hard to do at all for many climbers as one-hand hangs have a very high initial strength threshold. One answer may be to use a climbing wall like a system board and work on holding one arm positions with bad feet. You can also find ways to lessen the load slightly by hanging and pulling with the free hand lower on a rope or sling. Uneven pull-ups on an edge seem like a very good idea as well. Using a campus board can certainly make sense as well, especially as there is another factor to consider which I will call dynamic or active finger strength, in order to avoid the confusing term "contact strength." I would describe active finger strength as the strength needed to resist dynamic eccentric shockloading, the kind that is produced by grabbing a hold on the go at a distance, resisting a swing, as well as concentric loading as in pulling into the wall, resetting on the hold, and so on. This could be thought of also as finger power in that delivering force rapidly is of the essence. Typically finger strength in climbing is considered in isometric terms, i.e. a consistent load and position through the move. A simple observation of most single moves shows this is hardly the case. The initial load on the fingers is clearly much more severe compared to the later maintenance of the grip. Whatever can be done to limit the initial load (through technique, etc.) leaves more energy for successive moves. But this dynamic or active load continues throughout the use of one hold, since climbers are adding to the load by resetting their fingers, shifting their grip position, pulling their bodies in closer and of course pulling up to gain height. At every turn, body weight is shifted creating momentum and increasing force on the fingers. These increased forces rapidly induce fatigue which in turn increases force on the fingers through poor technique, clumsy grip, bad aim etc. resulting in failure on the move. The vicious cycle is experienced by all of us sooner or later. To me this implies that relatively static strength tests like one or two-handed hangs are potentially misleading indicators of resistance against severe loads. They might provide a baseline but hardly indicate practical strength. The analogy might be that of "safe working load" with construction equipment, where the breaking strength of an item is reduced to 1/5 of the amount to indicate its "real" strength in use. So the ability to hang on with one hand for 5 or even 10 seconds is of dubious relevance compared to being able to very rapidly latch the same size hold 3 feet up and go another two feet from that with a minuscule foot. And two-handed hangs distort that strength measure even more since you almost never execute a move with two hands side by side. The solution lies in several directions. The first is that static strength measures provide some quantifiable baseline with which to measure progress but little more and may be of surprisingly low relevance in actual practice. Second, in training for climbing you must find ways of safely shockloading fingers and arms in as sport-specific a way as you can. If possible each arm should be isolated to some extent when training finger strength. So, for example, double-dynos on a campus board are not typical in climbing and probably shouldn't be trained. In regular campusing, laddering where your arms are always going one or two (or more) rungs beyond each other should be standard. Third in actual climbing practice, finding ways to reduce the initial shockload of gripping the hold and any subsequent shifts of weight or position should be emphasized. Good foot placement is important here as with so much of climbing. Make sure that in every move, both hands are working together as much as they can to lessen the individual load, since (remember the initial finding above) two hands working together are many times stronger than one hand working alone. Obviously the more quickly moves are done, the less energy is expended hanging on, so using momentum to follow through can be very helpful. Training arms and fingers in isolation is clearly more stressful and should be done primarily in the context of climbing, most of the time. Specific workouts that involve campusing, fingerboards, etc should be done when fresh and at least 3 to 4 days apart. Oppositional exercises and shoulder strengthening should be consistently done along with liberal stretching of forearms and even having bodywork done as needed. Most important of all is patience as the most useful and least injurious results come slowly and in small increments.